The lotus flower starts as a small flower down at the bottom of a pond in the mud and muck. It slowly grows up toward the water's surface, continually moving toward the light. 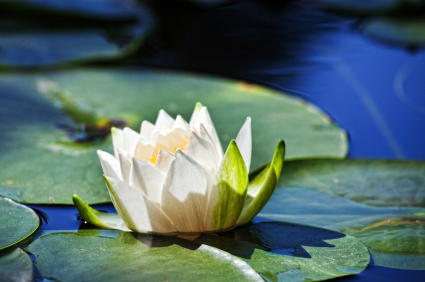 Once it comes to the surface of the water, the lotus begins to blossom and turn into a beautiful flower. Thus, the lotus represents the true essence of powerful change within us. We start at the muddy depths and rise continually upward as we grow. The whole time we trust that our journey to the surface will result on our exquisite transformation as we bloom into our full beautiful potential. I have designed the Lotus series to capture this essential human spiritual journey. Through these recordings, covering a variety of topics, you will move from the muddy depths toward your rightful place as a beautiful self-realized individual. Abundance - Lotus Lotus recording focusing on Abundance - using the Law of Attraction to get what you want! I Love To Exercise - Lotus Lotus recording for improving your relationship with exercise - finally start to love it and have it as a natural component in your lifestyle!